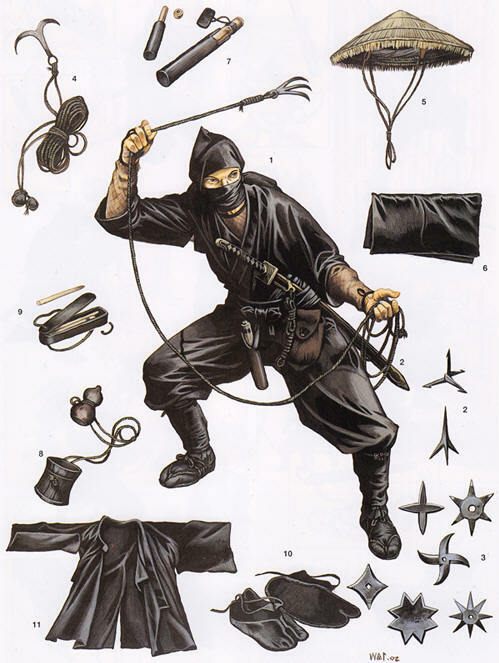 Ninja warriors used a wide range of various weapons of any varieties that people would not guess they existed. The Ninja used the kinds of weapon appropriate for the particular mission and nothing unwanted was carried. Ninja missions required quick response and the possibility to escape easily. Thus, loads of equipment could only suspend and prevent from surviving. However, a single kit of weapons was a must for the Ninja warriors called Shinobi-rokugu. • Uchitake – a small bamboo pole, sometimes two poles with one inserted into another (25 cm in length with the diameter of 7 cm), with holes and the rope to fasten. It was used as the container to transport cinder. The uchitake was used as the torch lighter in the medieval Japan.